The three tests at Pokhran on Buddha Poornima have proved that India can build a bomb for every threat—a fission device, which proves the capability to build a quick and crude bomb (already proved in 1974); a low-yield device, which can be weaponised as a warhead for the Prithvis, and a thermonuclear device of superpower category, which can be converted into bombs of hundreds of kilotons. It is the third one—the thermonuclear device—that has not just shocked but virtually terrified the White Houses, the Downing Streets, the Kremlins and the Forbidden Cities. From mere nuclear weapons capability, India has leapfrogged into a potential megaton superpower. In fact, what emboldened the government to decide on a triple test, including a thermonuclear device, was actually a technological breakthrough achieved by BARC scientists in extracting tritium from heavy water available in the country's atomic power reactors. Interestingly, the technology was acquired as a result of human concern. Scientists at India's nuclear installations were concerned about the radiation levels that reactor workers were exposed to, particularly from the high tritium levels contained in heavy water flowing around the moderator circuit in reactors. Workers in American or European or Russian reactors are not exposed to this particular risk as most countries (the main exception being Canada) use light water. India had chosen heavy water as moderator in its reactors long ago. Heavy water has a high content of highly radioactive tritium, which is actually a radioactive isotope of hydrogen. BARC scientists wanted to reduce this, so that the workers are exposed to lower levels of radiation. First, they attempted to extract the tritium through water distillation, but soon abandoned it. For, the process turned out to be highly risky as the tritium extracted in this manner was obtained in liquid form, which is deemed to be hazardous. So they thought of a chemical exchange process, followed by cryogenic distillation. In this method, tritium exists in liquid form only during the chemical exchange process. Through cryogenic distillation, it is converted into gas, which can be stored in reinforced containers. The tritium thus obtained is 90 per cent enriched, which incidentally is the requirement for the thermonuclear device. Incidentally, another hydrogen isotope, deuterium, can also be used for thermonuclear weapon design and this is why thermonuclear bombs are popularly called hydrogen bombs. In short, the attempt to make heavy water in the reactors safer has yielded the key material for a thermonuclear device. A pilot detritiation plant was set up at the research reactor at Kalpakkam. Now, BARC is learnt to be planning to set up similar plants in all the power-generation reactors in the country. Which means, as more and more electricity is produced, there will be bigger and bigger stockpiles of tritium. The detritiation technology developed by BARC is not only unique, but pioneering too. The United States is today facing a critical shortage of tritium. It stopped manufacture of tritium in the late 1980s as stockpiling of tritium is actually a wasteful exercise. For, tritium has a half life of 12.3 years; in other words, the stockpile will be reduced to 50 per cent in this period and the 'vanished' half would have converted into helium-3. The United States, having stopped tritium production, is now faced with a major problem. It would not have enough tritium stockpiles to build newer thermonuclear bombs and warheads in the next century. Now desperately searching for tritium, US scientists are thinking of manufacturing tritium through the age-old accelerator process, which is estimated to cost about $7 billion. It is in this context that the Indian innovation assumes significance. For the BARC method is dirt-cheap compared with the American process and also makes use of heavy water, a material available in excess in India. Once an importer of heavy water, India exported 100 tonnes to South Korea last year. The government is still reluctant to reveal the amount of heavy water produced in the country, but admits that the total manufacturing capacity of all the heavy water plants in the country would come to more than 650 tonnes a year. Now, even if US scientists were to succeed in developing the technology of extracting tritium from heavy water, that would serve no purpose. For, none of the US reactors uses heavy water. Another desperate proposal in the United States is to approach Russia for tritium. Russia is expected to have a decent stockpile as it dismantled many of the aged warheads to conform to the strategic arms reduction treaties. The US expectation is that the tritium extracted from these dismantled warheads may be put for sale. Tritium and deuterium are vital components of the thermonuclear bomb, which has no critical mass, unlike an ordinary fission bomb. So thermonuclear bombs of various intensities—from a few kilotons to megatons as in the case of the warheads of intercontinental ballistic missiles of the superpowers—can be fashioned with it. Tritium is essentially used in these bombs to boost the yield. Now, what India has demonstrated is that it can build a real mega-bomb of the superpower variety. Of course, India is yet to acquire a bomber or a missile capable of delivering such a high-yield bomb. Herein comes the relevance of Agni, which can carry a warhead weighing one tonne over 1,500 to 2,500km. Agni's second stage is learnt to have already been cleared by the government. And blueprints for an intercontinental ballistic missile are learnt to have already been prepared. enemy's force concentrations, rather than soft targets like cities. To that extent, the Prithvi is hardly a weapon of deterrence. But a nuclear cap on its head would alter the scenario. Any potential enemy would think twice before moving his armoured columns within the range of a nuclear-tipped Prithvi. The third test, of a fission device, was hardly any technological marvel. India had demonstrated its fission capability as far back as 1974 and a repetition of the test could only be interpreted as a demonstration of its bomb-making intentions. For, in the event of India being forced to make a couple of bombs, which can be delivered from bombers, the fission route is believed to be the quickest and yielding credible deterrence. Thus there is virtually a potential bomb for every occasion. If nuclear deterrence is to be achieved overnight, there can be a few fission bombs; if a credible deterrence with a missile force is to be achieved, there is the low-yield variety that can adorn the Prithvis. And for the long-term deterrence and superpower status, there is the thermonuclear one. Interestingly, the three tests on Buddha Poornima day and the two sub-kiloton tests three days later have the combined effect of eliminating any need for further tests. For, the second round of two tests was exactly aimed at that. And that is a 'secret' now being exchanged between the big five exclusively in the wake of the Comprehensive Test Ban Treaty negotiations. The technological politics behind the CTBT was that the big five nuclear powers are now willing to give up tests because they can conduct sub-kiloton tests (which are not prohibited by CTBT) and simulate them on computers to yield higher kilotons or even megatons. So, if, say, one of the big powers wants to build a new warhead of 100 kilotons, it would conduct a virtual laboratory test of less than one kiloton, feed the data into computers and project them into higher kilotons. The data thus projected can be used for building a new type of bomb. The United States, which was originally opposing a comprehensive test ban, developed the technology only a couple of years ago. In fact, the National Ignition Facility is still under construction at Lawrence Livermore National Laboratory near San Francisco. Once it was certain that it needed no more high-yield tests to make newer bombs, the US suddenly began pushing for a total ban on tests. But other nuclear powers, especially France, were still not ready for a complete ban. So, the United States offered to transfer the simulation technology to France and the two are now together building a Megajoule Laser Facility near Bordeaux. China too is believed to have extracted a similar assurance from the United States before it agreed to join the CTBT. In effect, the big five were pushing for a total test ban only after they were certain that they acquired simulation technology. It is this technology, exchanged exclusively among the big five, that India has demonstrated in the second series of tests. Two sub-kiloton devices were exploded and the data gathered from them has been fed into supercomputers. In other words, India has proved that it has the capability to build bombs without conducting a full test. The hydrogen bomb is a fusion device. A vast amount of energy is released when common hydrogen isotopes like deuterium or tritium are fused. Fusion occurs at extremely high temperatures (millions of degrees). These reactions are known as thermonuclear (heat-induced) reactions. Hence, the weapon is known as a thermonuclear bomb. A hydrogen bomb needs an atom bomb to serve as a trigger. 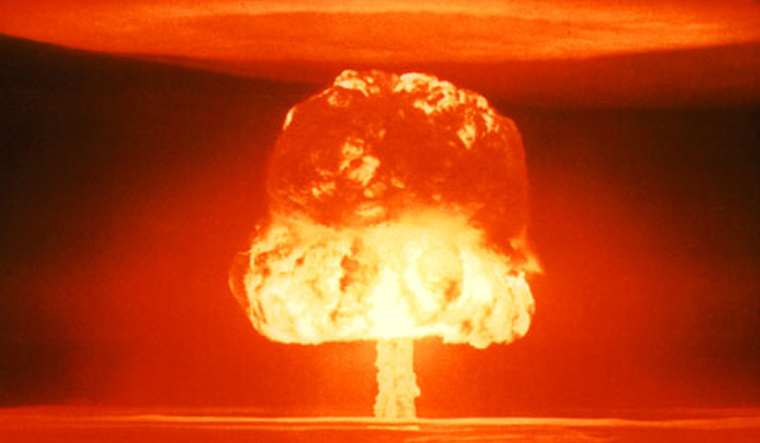 The atom bomb produces neutrons and the heat that is needed to ignite the hydrogen bomb. The yield or total energy released by a hydrogen bomb is expressed in megatons. About 500 grams of hydrogen can yield power equivalent to about 29 kilotons of TNT. A nuclear weapon's power is expressed in terms of TNT needed to produce an explosion of the same intensity. This article is part of a series from THE WEEK on the 20th anniversary of the Pokhran-2 nuclear tests undertaken by the government of Atal Behari Vajpayee. The Pokhran-2 tests—which saw India test 5 nuclear weapons at Pokhran, Rajasthan on May 11 and 13, 1988—led to India declaring itself as a nuclear weapons state. This series covers archival materials on how THE WEEK covered the Pokhran tests in 1998, the preparedness of India's military in a nuclear age and the threat of terrorists getting their hands on 'dirty bombs'.